We like granola for breakfast at our house -- especially my husband and I (who have finally started to outgrow regular sugary cereals.) I've even tried to make it myself, but I admit that the ingredients are often too expensive to do this very often. It wasn't as sweet. This is important, as I really like to enjoy each individual ingredient in a granola, whether it be the nuts, the dried fruit, or the types of grains. It's granola-- it should taste natural! The granola wasn't in big clumps. This makes it perfect for using in your own homemade bar and cookie recipes! Nature's Hand has several benefits, including the fact that it has no added salt, preservatives, artificial colors, or artificial flavors. 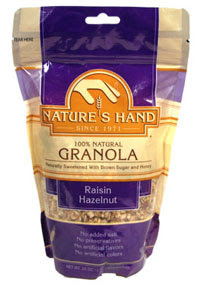 It's also made right here in the U.S.A. And if you like charity, you'll be pleased to know that Nature's Hand is the official granola supplier for Outward Bound! You can read about all the delicious flavors for this affordably-priced granola at their website. *Samples were received to facilitate my review.